What is a Mallard Duck? When most people think of ducks, they think of the Mallard Duck. The Mallard is a common duck mostly found in North America, Europe, and Asia. The Mallard Duck is also found in Central America, Australia, and New Zealand. The scientific name for the Mallard Duck is Anas Platyrhynchos. It is part of the species of Dabbling Ducks. Mallard Ducks enjoy the water and usually are found near rivers, ponds, or other bodies of water. Mallard Ducks will grow to about two feet long and weigh around 2 ½ pounds. The female Mallard has tan colored feathers all over while the male Mallard Duck has a green head, darker colored back and chest, and a white body. 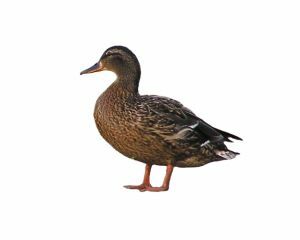 Some people actually breed domestic versions of the Mallard Duck so they have different colors. Mallards are omnivores. This means they eat both plants and other animals. They mostly feed off of the surface of the water eating all kinds of seeds, small fish, insects, frogs, and fish eggs. They also enjoy eating some human foods, often eating grain from human crops. Female Mallard ducks are famous for their "quack". When you grew up and learned that ducks make a quacking sound; that was from the female Mallard. Females quack to call other ducks to them, usually their baby ducklings. This call is often termed the "hail call" or "decrescendo call". The ducklings can hear this call for miles. Like many birds, Mallard ducks join flocks and migrate from the north to the south for the winter and then back north for the summer. This way they are always where it is warm and there is food available. These ducks are adaptable in other ways as well. They do well even when their natural habitats are taken over by humans. This doesn't mean that we should destroy their habitat, but, so far, they have not become endangered by human interaction. 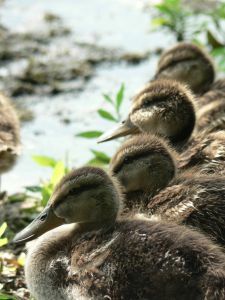 Baby Mallards are called ducklings. A mother duck will usually lay around 10 or so eggs. She tends the eggs by herself in a nest. Shortly after the ducklings hatch out of the eggs, the mother duck will lead them to the water. From that point on, they usually do not return to the nest. Baby ducklings are ready to go within a few hours after they hatch. They can swim, waddle, feed themselves, and find food right away. Their mother will watch over them and help protect them for the next few months. After around two months, the ducklings can fly and will become independent. The male Mallard is called a drake and the female a hen. Ducks may waddle along slowly, but they can fly pretty fast. At top speed they can hit 70 miles per hour! 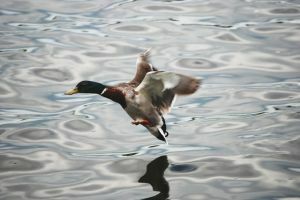 Mallards can fly nearly vertical, if needed. This includes taking off from the water almost straight up. It is estimated that there are over 10 million mallard ducks in North America. A group of ducks that are flying is called a flock, but when they are on the water the group is called a sord.